On last week's episode of "QuoteValet: Necessary, REALLY Necessary, or 'No, Seriously, You Need This'" we discussed how Simplicity and Efficiency are a huge part of QuoteValet. I also tried to make a correlation between QuoteValet and '80s cartoons, which I believe I ~62% succeeded at. So, let's recap. Michelangelo = Simplicity, while Leonardo = Efficiency. That leaves Donatello as Service because that guy is always putting research first and pizza second. I decided Raphael represents Sophistication because he thinks he's cooler than everyone even though he was voiced by Corey Feldman back in the day. Also, he was the last turtle to pick from. I can hear you begging for more, so I'll just get right to it. QuoteValet adds an entirely new dimension to your sales department's level of customer service. When you're on the road, instead of waiting to get back to the office to correspond with customers about their quotes, you can use QuoteValet Mobile (free with your QuoteValet subscription) to do so. Using your tablet or any other mobile, browser-based device, you can perform the same tasks as you would in regular QuoteValet. We regularly use QuoteValet Mobile at conferences, and potential customers tend to be impressed with its flexibility and ease of use. 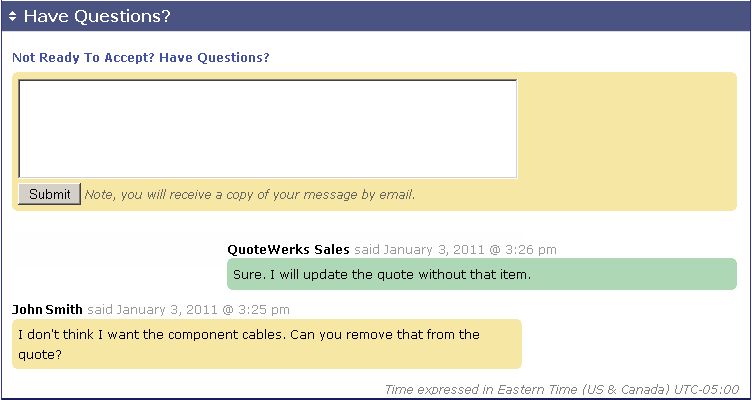 QuoteValet also allows customers to leave comments on quotes not only when accepting them, but long before. This eliminates the need for separate e-mails regarding the quote (which can get confusing if you have many quotes), as the comments will be e-mailed to both you and the customer automatically and IMEMDIATELY. Talk about quick follow-up. 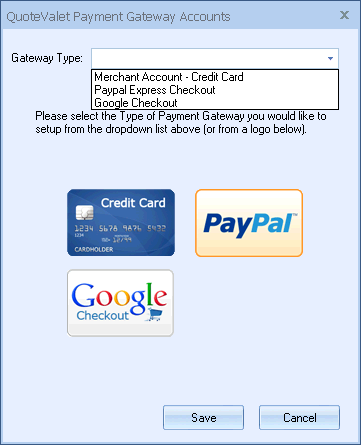 Your customers also don't have to give you their credit-card information over the phone or e-mail, pay separately on the PayPal website, etc. QuoteValet also supports a slew of credit-card gateways, so your customer should be covered for pretty much any gateway you could think of. Except Monopoly money. We don't dabble in that, because Monopoly makes everyone angry after the first 30 minutes. And by angry, I mean murderous. On that note, we'll move onto our last trait: Sophistication. No joke, QuoteValet is fancy. Not, like, St.-Tropez-and-caviar-fancy, but at least dinner-and-dessert-on-a-Saturday-night-at-Olive-Garden-with-seating-near-but-not-TOO-near-the-restrooms fancy. Custom templates let you add your company logo, company details, your own signature, and your own photo (or a better-looking stock photo you can pretend is you). Any resemblance to real persons in that picture is coincidental. And should also probably be reported to the police ASAP. You can also show photos of items on your quotes! This is helpful for people in the same way it is helpful to have pictures on restaurant menus. But unlike Waffle House's offerings, your customers' items won't show up looking completely different from the picture, angering them temporarily until they taste it, realize it's actually heaven on a plate, and grumble something about Photoshop and/or capitalism through a mouthful of smothered hash browns. Accessible right within QuoteWerks, the QuoteValet Dashboard gives you a real-time look at what customers are currently doing with their quotes since the last time you viewed the Dashboard. You can also easily keep track of expiring quotes, view activity for all documents uploaded to QuoteValet, view all payments that have been applied to QuoteValet documents, and much more. 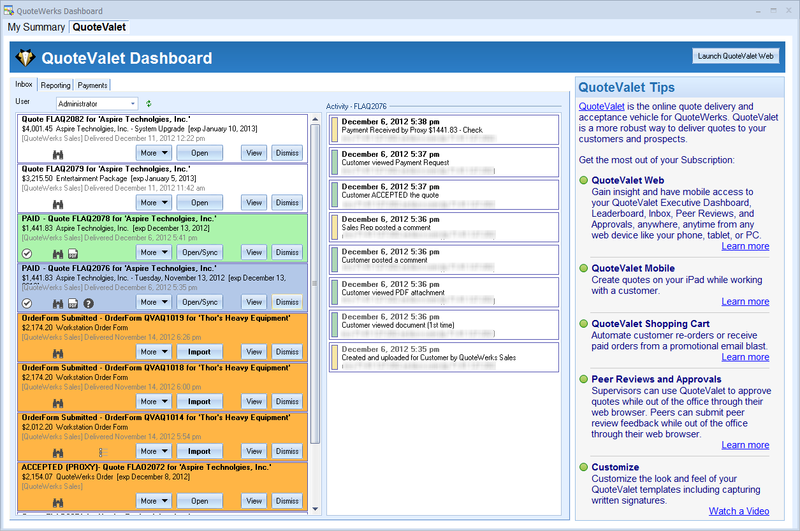 QuoteValet Web (which also has a mobile version) gives you clear visibility over quoting and sales processes across the board, from all sales reps. View top-dollar quotes and converted orders; number of quotes sent, accepted, and paid; sales-rep and customer comments; number of customer views on documents; and more. You can also use QuoteValet Web to easily compare sales reps' performances, collaborate on and approve documents, and more. 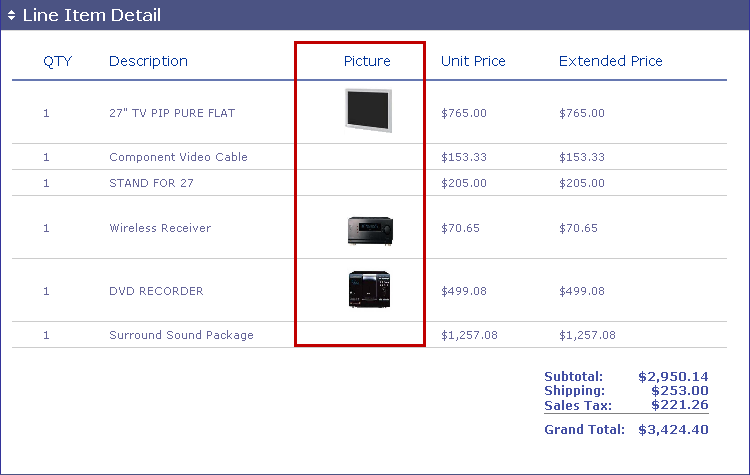 The QuoteValet Shopping Cart allows you to build and use online order forms to automate customer re-orders and receive paid orders from promotional e-mail blasts! This is a huge asset to those customers who routinely order the same products and services (especially low-dollar ones that don't need much nurturing to sell again). Simply send the appropriate cart link to your customers, and their reorders will appear in your QuoteValet inbox. There's nothing to it! In a turtle nut shell, QuoteValet delivers your quotes interactively and works seamlessly with your existing QuoteWerks installation to do so. 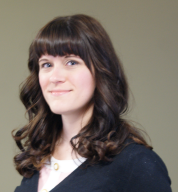 No time-wasting e-mails, payment ping-pong, handwritten signatures, or follow-up frustrations. How many people can say that about their quoting process? And the best part? You don't even have to tip us. Maybe we should rename it to QuoteValHEY YOU GET TO KEEP THAT $5 BILL WITHOUT FEELING GUILTY! Just kidding, that is way too long of a title and makes unfair assumptions about fair valet-tipping prices. WAIT, I promised a Shredder mention, so here it is. Thanks, George Takei. GET IT? 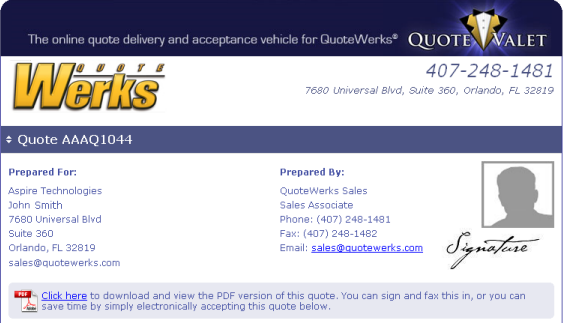 BECAUSE QUOTEVALET IS PAPERLESS. I got the joke and am proud of myself, so just give this one to me. Have you used QuoteValet? If so, what do you think of it? Is there any way we can improve it? 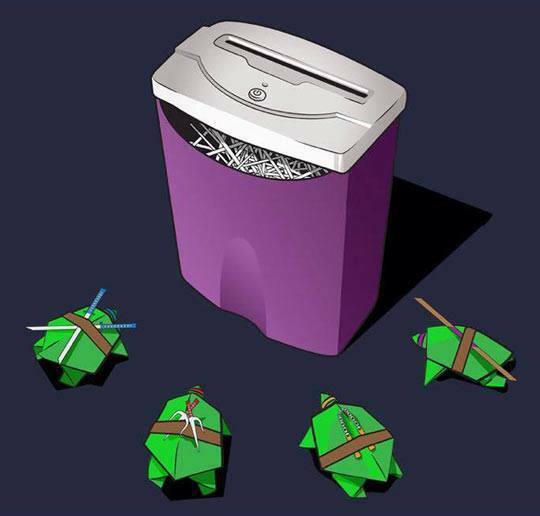 Who's your favorite TMNT character? What do you think about this Michael Bay interpretation that's coming out next month (I personally feel Megan Fox was miscast)? Should I stop asking questions now?